Tesla, Inc. (formerly Tesla Motors) is an American company that specializes in electric automotives, energy storage and solar panel manufacturing based in Palo Alto, California. Founded in 2003, the company specializes in electric cars, lithium-ion battery energy storage, and residential photovoltaic panels (through the subsidiary company SolarCity). The additional products Tesla sells include the Tesla Powerwall and Powerpack batteries, solar panels and solar roof tiles. The company's Model S was the world's best-selling plug-in electric car in 2015 and 2016. Global sales of the Model S reached the 200,000 unit milestone during the fourth quarter of 2017. In September 2015, the company released its Model X, a crossover SUV. The Model 3 was released in July 2017. 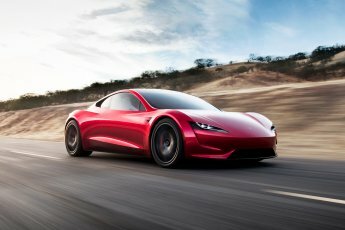 Tesla global sales passed 250,000 units in September 2017. Tesla operates multiple production and assembly plants, notably Gigafactory 1 near Reno, Nevada and its main vehicle manufacturing facility at Tesla Factory in Fremont, California. The Gigafactory primarily produces batteries and battery packs for Tesla vehicles and energy storage products. In 2016, Tesla topped Consumer Reports Annual Owner Satisfaction Survey at 91%. In February 2017, Consumer Reports named Tesla as the top American car brand and ranked it 8th among global carmakers.